CCAP has learned about a new threat to the housing for Downtown Eastside residents. 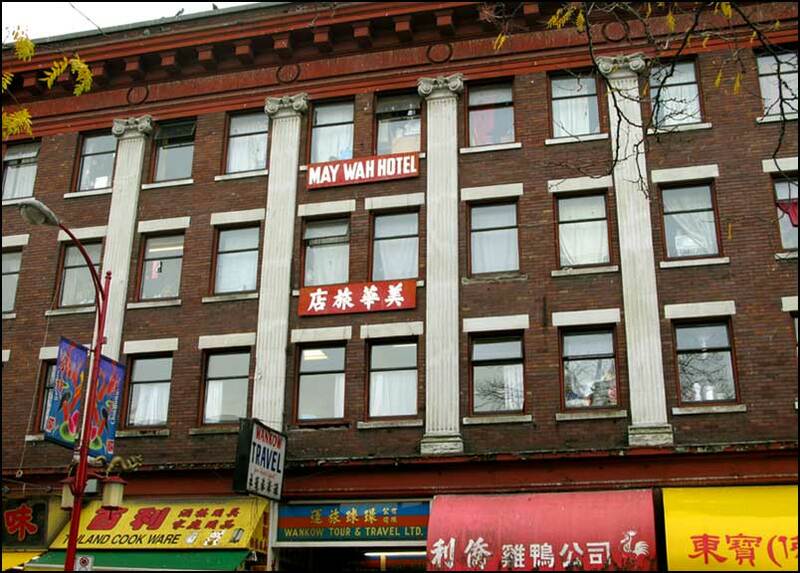 The May Wah Hotel on East Pender Street, owned by the Shon Yee Benevolent Association, is now up for sale, leaving the future of the 120 units of low-income housing, and residents who live there, up in the air. The building has been fixture to the community providing rent as low as $175 to low-income Chinatown residents. The hotel is one of many SRO hotels in Chinatown owned by benevolent societies, which together provide almost 600 units of low-cost housing. According to newspapers, the decision to sell the hotel came after years of discussion in the society, which has been conflicted between desires to preserve the housing obtained by their elders, and liability concerns as both the building and society members aged. The decision to sell was made in April, with a deadline for offers set this month. Vision Vancouver city councillor Raymond Louie claims that there are limits on what a new owner could do since the building is protected both as a residential SRO hotel under the SRA by-law and as a designated heritage building. However, CCAP has seen how these protections means little to nothing in practice for low-income tenants. According to the by-laws, landlord who want to re-develop SRO units have to pay a $125,000 conversion fee per unit. However, many SROs have been able to evict their tenants, renovate the buildings and charge higher rates for the rooms without paying the $125,000 per unit fee.